The new 12nm GPU tested versus the RX 580 and GTX 1060 6GB. AMD's latest card has been revealed. 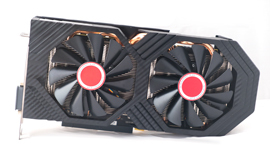 The Radeon RX 590 is the first AMD card produced using a 12nm process, allowing the card to reach significantly faster clock speeds than the 14nm RX 580. However, that does come at a cost in the form of a 40W jump in power consumption and a higher price: $279 for the RX 590, versus $229 for the RX 580. In this preview, we'll show you how the new RX 590 performs against its closest competitors ahead of our full DF review. The RX 590 is intended to slot between the RX 580 and Vega 56 on AMD's totem pole, thereby achieving strong 1080p performance with a little more headroom to play at max settings or chase high frame-rates without the extra cost and features of AMD's Vega chips. We should also expect 1440p performance to be improved, although even the best RX 580 models only managed console-quality frame-rates in the most demanding titles. In terms of Nvidia's GPU lineup, the RX 590 ought to offer faster performance than the GTX 1060 6GB without challenging the significantly more expensive GTX 1070. So what exactly is the difference between the RX 590 and RX 580? In truth, there's not a lot to separate them. While the 12nm process allows the RX 590 to run at higher frequencies than the RX 580 (1545MHz compared to 1340MHz), the two cards share the same number of compute units, shaders, memory and more. The only difference is that these higher frequencies require more power, with the new card's TDP has grown from 185W to 225W. It's clear that AMD were aiming to make a new card with a minimal investment of time and resources, and boosting frequencies while leaving the overall design the same is a very efficient way to do just that. The RX 590's 12nm process allows it to run at a higher clock speed than the RX 580, but the core design and features remain unchanged - it has the same die size, the same memory clocks and the same type of VRAM. AMD isn't producing any own-brand 'reference' designs for the RX 590, so we will be testing a custom design made by one of their partners instead. AMD sent us the XFX Fatboy OC+ edition of the RX 590, an overclocked model that reaches a 1580MHz boost clock thanks to eleven-bladed 100mm fans and substantial thermal superstructure. The card also cuts out its fans at idle to ensure it remains quiet in day-to-day usage. This extra performance does require more power, and six-pin and eight-pin inputs are included here. In terms of I/O, we have three DisplayPort 1.4 connectors, one HDMI 2.0 port and one DVI-D port. It's also worth mentioning the hardware we're using to test here, as it's a little different to our usual fare. We have retained a Core i7 8700K pinned to 4.7GHz, which ensures that the processor shouldn't be a limiting factor here, but the CPU cooler, power supply, case and testing environment are all different. Therefore, the results here aren't directly comparable to earlier Digital Foundry articles - instead, it's the differences between each card that are the most important. With that proviso out of the way, let's move onto the results of our testing in ten recent and popular games, focusing on 1080p - still the most popular PC gaming resolution as of writing. We're looking for at least 60fps in the most demanding games at their highest settings at this resolution, at least 90fps in well-optimised titles and north of 120fps for older games played as esports. Note: Rise of the Tomb Raider's very high preset is used with the high textures setting. From testing at 1080p, the trend is pretty clear - the RX 590 delivers a small but noticeable improvement over the RX 580, delivering a performance improvement between three to seven per cent. The biggest leaps come in the most challenging titles, like The Division and Ghost Recon Wildlands, where the higher clock speed of the RX 590 is most keenly felt. From our testing of these two cards, a performance gap of about five per cent is observed. It's worth noting that the two cards we've tested aren't necessarily equivalent, though - the Nitro+ card is essentially the fastest RX 580 you can buy, while the Fatboy is perhaps closer to what we'd consider a mid-tier RX 590. We'll return to this topic in our full review, so stay tuned. The differences become greater when you consider the RX 590 and the GTX 1060. Here, the GTX 1060 manages one outright win - in the World of Tanks Encore benchmark which seems to heavily favour Nvidia hardware - but falls further behind in the remaining results. In The Division, there's a 17 per cent advantage for the RX 590, while in Forza Horizon 4 the margin is 24 per cent. However, the greatest impact is felt in PlayerUnknown's Battlegrounds, where the RX 590 has a significant 26 per cent lead that transforms the game into one that could actually benefit from a high refresh rate 100Hz+ monitor. Again, a custom GTX 1060 6GB board running at a higher clock speed could narrow this gap, but not enough to make the GTX 1060 the better option. While the differences between these three cards are largely felt at 1080p, there are two situations where you won't see a massive difference. First are esports titles, which often run at high frame-rates and are therefore more CPU-dependent. Looking at Counter-Strike: Global Offensive and Rocket League, you can see that even with the highest possible graphical settings, at 1080p there is a microscopic difference between all three cards thanks to our hefty overclocked Core i7-8700K. There is a similar result at the other end of the spectrum, in our most punishing benchmark: Ghost Recon Wildlands. In this case, while frame-rates differ between the RX 580 and RX 590, the effect is only a few frames per second - so you'll gain more from tweaking the settings than you will from swapping graphics cards. While the raison d'etre for the GTX 1060, RX 580 and RX 590 is 1080p gaming, all three can stretch to 1440p if you're willing to accept a loss of visual fidelity by turning down some key settings in the most demanding games. We haven't turned down any settings here, but you can see that some cards are within much closer striking distance to 60fps in recent titles than others. Specifically, there's a more obvious gap between the GTX 1060 and the RX 580 than there is between the RX 580 and RX 590. Forza Horizon 4, PlayerUnknown's Battlegrounds and The Witcher 3 all run below 60fps on the GTX 1060, but grab a few frames of breathing room above 60fps on the AMD cards. There's a similarly large jump in The Division, where we see a 26 per cent increase by swapping the 1060 for the RX 590. Modern games running DirectX 12 tend to show the largest improvements, but AMD is competitive in older DirectX 11 games as well. Complicating the value-for-money calculus somewhat is AMD's new game bundle deal. If you buy an RX 590 or an eligible system with the graphics card pre-installed, you'll be able to download three upcoming games upon their release in spring 2019: Devil May Cry 5, The Division 2 and Resident Evil 2. Each is being sold for $60, putting the potential savings at $180 if you'd planned to get all three at launch for full retail. From these results, it's clear that the RX 590 offers small but noticeable improvements over both the RX 580 and the GTX 1060 in almost all of the games we tested, with the largest margins in recent DirectX 12 games. However, it's not yet clear whether AMD's board partners will sell the RX 590 at its recommended retail price - and what will happen to the prices of existing GTX 1060 6GB and RX 580 models. Assuming that prices stay as they are and the RX 590 launches at its $279 RRP, the RX 590 offers noticeably better performance than the GTX 1060 6GB at only a slightly higher price. However, the RX 580 remains the best value-for-money choice for 1080p gaming, with many cards available at $200 or less while offering somewhere between 90 and 95 per cent of the performance of the RX 590. Hungry to learn more about the RX 590? We are too! We'll have a full review of the Radeon RX 590, with the in-depth Digital Foundry analysis and bespoke live benchmarks you've come to expect, once we've had a chance to spend more time with the new card. Stay tuned!